© 1998 by Thieme Medical Publishers, Inc.
Multifocal motor demyelinating neuropathy is an acquired immune-mediated neuropathy with distinctive clinical and electrophysiologic manifestations, and response to treatment. Clinically, it is characterized by slowly progressive asymmetrical predominantly distal weakness; unilateral wrist drop, grip weakness, and foot drop are the commonest initial manifestations. Electrophysiologic testing reveals multifocal motor demyelinating features. Persistent, localized, partial motor conduction block is the hallmark of the disorder. Results of sensory nerve conduction studies are generally normal, consistent with the lack of sensory symptoms and signs. Most patients show marked improvement in strength after treatment with intravenous human immunoglobulin or cyclophosphamide. The pathogenesis of the disease is not completely understood. 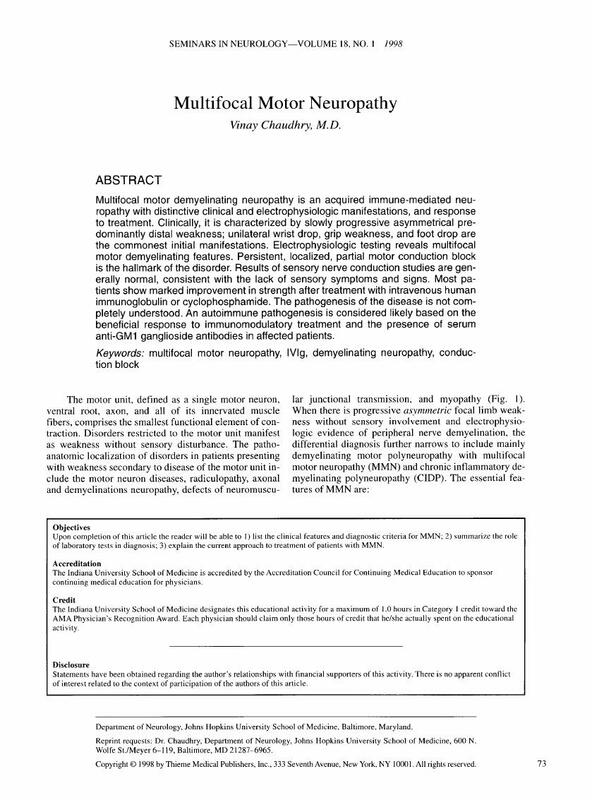 An autoimmune pathogenesis is considered likely based on the beneficial response to immunomodulatory treatment and the presence of serum anti-GM1 ganglioside antibodies in affected patients.